Just in time for Mother’s Day, Women’s Empowerment Workshop presents Heart2Heart, a weekend retreat for mothers and daughters ages 16 and older. Created by Susie Kincade and featuring a stellar crew of professional guides, Heart2Heart offers a nurturing, playful experience in nature for mothers and daughters to enrich and deepen their relationship, build trust, and explore the phases of womanhood together. 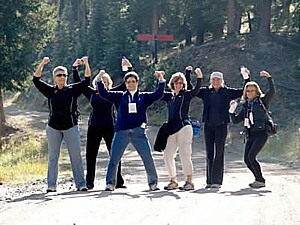 The retreat will be held May 17-19 in Vail, Colorado at the Vail Racquet Club Mountain Resort. Led by life and spiritual coaches and mothers of six daughters between them, Susie Kincade and Narda Reigel, transitional life coach specialists, the weekend includes developing trust through a rock climbing adventure, communication exploration and deep listening skills, as well as having time to enjoy yoga and spa experiences, restorative reflection, and gather for chef-prepared meals in the nurturing and inspiring setting of Vail in springtime. Formed two years ago, Women’s Empowerment Workshop started with one four-day nature adventure retreat, now called Awaken in NatureTM which combines outer and inner journeys through rafting/kayaking, rock climbing, hiking, healing with horses and other nature-based activities. The retreat drew attendees from as far away as Pakistan and from a dozen U.S. states. Its success led founder, Susie Kincade to create additional retreats and diverse workshops to satisfy the hunger she sees in women of all ages across the world who want to rise to their full potential. PsycheHike is one of the many adventures at Camp Experience, a weekend retreat for women to be held at Copper Mountain, Colorado, Sept. 23-25 (photo by Kimberly Anderson Photography). Camp isn’t just for kids anymore with the sixth annual CampExperience™, a one-of-a-kind retreat for women in Copper Mountain, Colo., on Sept. 23 – 25. More than 200 women from some of the country’s top organizations and businesses will come together in this casual mountain setting for a weekend of education, inspiration and networking. More than 150 campers are already signed up to share the energy of national keynote speakers like Victoria Moran (www.victoriamoran.com) and Linda Larsen (www.lindalarsen.com), applaud Women Who Rock award winners, and indulge in “adventure” activities such as dance, biking, fly-fishing, self defense and a camp favorite, PsycheHiking. Workshops this year are a new format with 2.5 hour “emersion” sessions with hand-on learning and experiences on topics such as advocacy, writing a book, embracing food as fuel and healthy weight management, emotional intelligence and stress-less living. There’s also yoga and Qi Gong to start the day, and a hands-on Creativity Corner is open throughout the weekend with pottery, jewelry making, painting and fabric art. The popular Charity Bow-tique is back and doubled in size to offer more retail fun to benefit this year’s charity partners: Warren Village, United Way Women’s Self Sufficiency Programs, Women’s Bean Project and Rocky Mountain Children’s Law Center. Campers are asked to give three gently used or new items for the Bow-tique and to sign up for personal services (e.g., massages, reflexology, reiki and more) in exchange for a donation. Since 2006, CampExperience™ has donated more than $138,000 in cash and in excess of 12,000 pounds of clothing and household goods to its charity partners. “CampExperience™ is my annual respite to refuel, recharge my batteries and reconnect to amazing women in the community. In my busy life, I appreciate that CampExperience™ is built for me and maximizes my personal and business success,” says five-year camper Carol Calkins of Denver. CampExperience™ also will host MiniCamp at Regis University in Denver on April 20, a Charity Kick-Off Party at The Closet Factory in Centennial on May 18, a Sleepover Adventure at Spruce Mountain Guest Ranch in Larkspur on June 2 – 3, and many free networking events throughout the year. For more information about camp and these events and to sign up for a free newsletter, visit www.CampExperience.com or call 720.840.4001. You do not need to be registered for CampExperience™ to attend pre-camp events. Presenting sponsors for 2011 include CBS4, St. Anthony Central Hospital, Northwestern Mutual Denver, Regis University, Copper Mountain Resort, and Fastlane Productions. Host sponsors are Staples, MillerCoors, Colorado View Magazine, The Kentwood Company at Cherry Creek, KUVO Radio, Garvin’s Sewer Service, Clarity International, BBVA Compass, Tomboy Tools, Silpada Designs Farmers Insurance Group and Gay & Lesbian Fund for Colorado.